Link to My Mortgage Calculator - How Much Will My Payments Be? This calculator is so awesome! It has several features that allow you to send to anyone via email your entire amortized schedule of payments, provides a printer friendly version via a PDF file that you can print and tale to your Financial Adviser or Mortgage Specialist. Of course, this is no substitution for a top-notch Lender - so if you would like a referral to an excellent Lender in Virginia, let me know and I will recommend the best Lender in Virginia. Link to the Printer Friendly Version of the Amortized Schedule of Payments . 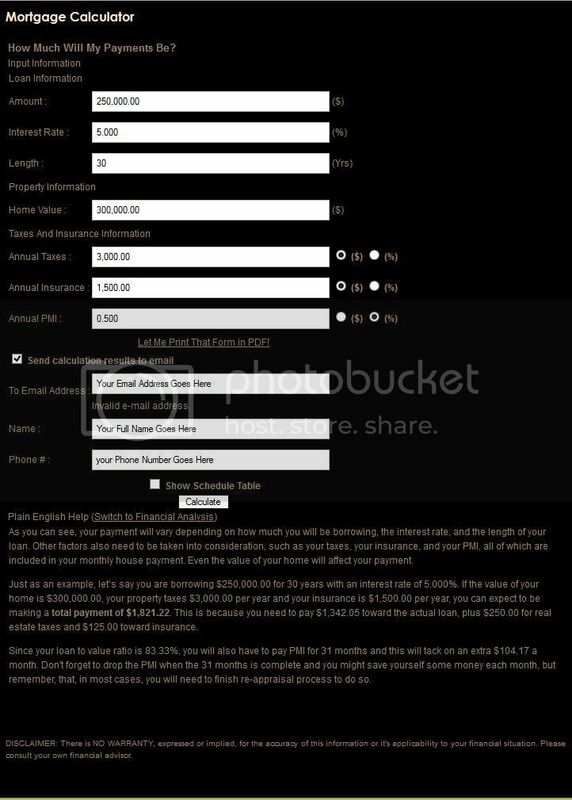 This Mortgage Calculator also provides you with a complete schedule of payments for every month of your loan! And you can print this in a PDF file or email to anyone you wish. DISCLAIMER: There is NO WARRANTY, expressed or implied, for the accuracy of this information or it's applicability to your financial situation. Please consult your own financial adviser. Start your mortgage calculations today!